Each year our volunteers are required to contribute 40 hours. Our list of approved projects that are within our guidelines is posted on the VMS Members-Only Login (link above), and the list is updated regularly. Service projects fall into one of these categories. Education/Outreach - includes public presentations, leading interpretive events, educational materials development. Members are also encouraged to develop their own volunteer projects with our chapter’s support. We encourage and automatically approve projects that are associated with our sponsors and local partners: Virginia Cooperative Extension; Virginia Department of Conservation & Recreation; Virginia Department of Environmental Quality; Virginia Department of Game & Inland Fisheries; Virginia Department of Forestry; Virginia Museum of Natural History; Virginia Living Museum; Virginia Institute of Marine Science; Newport News Department of Parks, Recreation and Tourism; The Mariners’ Museum and Park; Hampton Clean City Commission; and Sandy Bottom Nature Park. 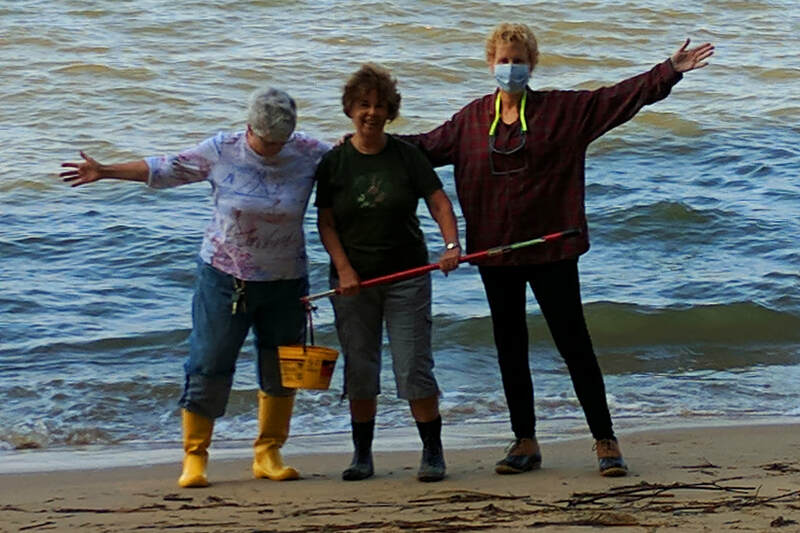 Under the auspices of Virginia Department of Environmental Quality and the James River Association, our volunteers collect and sample from local waterways on a recurring basis. Results are provided to state and local agencies for action as needed. Our volunteers serve as educators at the Virginia Living Museum and the Virginia Institute of Marine science. We also work on grounds and habitat maintenance with the VLM Horticulture Department, and keep things organized for the VLM Collections Department. At VIMS, our members volunteer in support of education and outreach, animal care, and learning garden staff. Peninsula Master Naturalists have restored the nature trail at Endview Plantation in Newport News for the enjoyment of visitors interested in history and nature. We also provided plant, tree, mushroom, and bird identification. Additionally, we developed an educational brochure about the interesting plants that can be found on the trail. We regularly maintain the trail to keep it passable and safe. Our volunteers connect children with nature at elementary, middle, and high schools throughout York County and Poquoson. This program provides teachers with materials and guidance to build or expand wildlife habitat, especially for Monarch butterflies, on school grounds. In 2015, we began a similar project called Pollinator Partners in Gloucester public schools. Volunteer Chris during a patrol and cleanup. As well as water sampling for DEQ and JRA, several members are trained River Rats for the lower James River. Whether walking a neighborhood stream, kayaking a local river, or boating the wide reaches of the lower James, JRA RiverRats document potential pollution sources and their effects while also reporting natural patterns in river hydrology and wildlife sightings. These efforts have helped with identifying issues and providing data for advocacy to protect the James and Chesapeake Bay. The Mariners' Museum and Park, Noland Trail - Improve entrances to the trail for safety, habitat enhancement, remove invasive plant species, and prevent unwanted runoff. FrogWatch USA – The Association of Zoos of America’s flagship citizen science program. Members will learn to identify local frog and toad calls. Each will monitor a specific site several times over the year, and enter the data into an online database. A Zoo in my Luggage – Inspired by the book of the same name by Gerard Durrell, we provide environmental education to elementary schools using hands-on live invertebrate specimens. RiverRats - Whether walking a neighborhood stream, kayaking a local river, or boating the wide reaches of the lower James, JRA RiverRats document potential pollution sources and their effects while also reporting natural patterns in river hydrology and wildlife sightings. eMammal Camera Traps – These volunteers place motion-sensing cameras in various parks to add to our knowledge of the species inventory and assist land managers. Environmental monitoring - Box turtle reporting for the Virginia Herpetological Society, eBird bird sighting entry, SKYWARN severe weather spotting, Lost Ladybug Project data observation and entry, Stinkbug count for Virginia Tech, etc. North American Bird Phenology - This project is sponsored by the U.S. Geological Survey. We enter bird observations from 1880 to 1950 online for studies on bird migration. It is a great project for those who cannot get outdoors as often as they might like. Vernal Pools Mapping and monitoring – Hike, find, and explore temporary spring pools, survey animal life, enter data online. Involves difficult off-trail walking and the use of a GPS unit. Tough, buggy work, but rewarding. Various summer camps, outdoor tours, events, and after-school programs – We have a number of projects focusing on environmental education for camp attendees, park-goers, and school students in Gloucester, Newport News, and Hampton. Our volunteers also set up education and outreach tables at many local events and festivals throughout the year. Tree planting and habitat restoration at Bluebird Gap Farm, Beaverdam Park, Bethel Landfill, and Ridgway Park, among others.